Tokyo is one of the most elegant, refined cities in the world, and the appreciation of true luxury is shown throughout the city in its cuisine, architecture and fashion. Know for its natural beauty, history, entertainment and expansive food and drink options, Tokyo is a must for any world traveler. I had the pleasure of living in Tokyo for three months in 2013 and gained valuable insight to the city of many delights. Upon exploring, I discovered one of the most notable accommodations in the city, The Palace Hotel Tokyo. Formerly an iconic 60s hotel, the historic property has since been transformed by a three-year restoration into a majestic architectural masterpiece. It was officially reopened in 2012, and the award-winning hotel has since been frequented by notable guests from around the world. 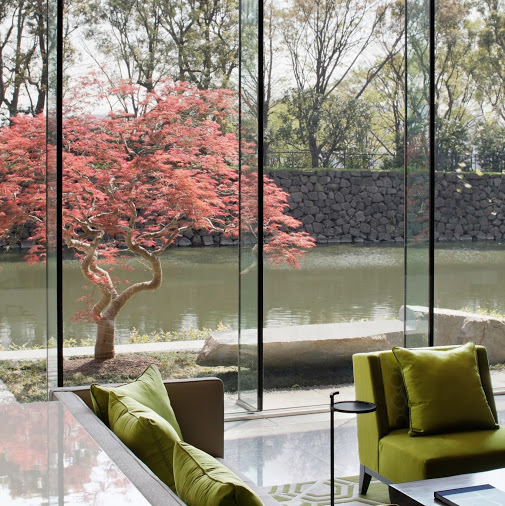 The hotel features 290 stunning rooms & suites, 10 luxe restaurants and bars, Japan’s only Evian SPA and incomparable views of the city’s most rareified green space, the Imperial Palace gardens. Located right in the heart of the Marunouchi business district and a short walk from the Tokyo station and the Imperial Palace, the hotel isin the perfect location for sightseeing and getting around Tokyo. Art aficionados will enjoy the surprising collection of art curated by local Art Front Gallery featured around the hotel. Valued at over one million dollars, over 1,000 different pieces add an elegance and individuality to the hotel decor not seen in most properties. With 10 different dining options, variety is the spice of The Palace. From elegantly sophisticated one-Michelin-star French food at Crown to authentic Japanese with a view at Wadakura to Old World Chinese at Amber Palace, diners will have a multitude of exotic choices. The Grand Kitchen offers all day dining options with an eclectic mix of American, French, Italian and Spanish. Hotel guests can also indulge in 24-hour room service. The hotel rooms feature contemporary interiors, and the design is sleek, yet comfortable, with such understated luxury features as 300-thread-count Imabari bed linens, Imabari towels and Anne Semonin toiletries. The soft, airy color palette of the rooms is inviting, with white and light greens framing a pristine wall of glass. Guests staying in Club Rooms or suites will enjoy access to a private Club Lounge. Most balcony suites have amazing views of the city, especially at sunrise and sunset. The bathroom has two entrances, one from the hallway and one from the bedroom; a separate soaking tub, in-mirror TV, separate rain shower and Toto heated-seat toilet. The hotel also keeps in mind its most discerning travelers with the creation of amenities such as the Quintessentially Tokyo package. Combining the best of arts, gastronomy, culture and the natural wonders of Japan, the package combines a unique collection of activities over a five-night, six-day stay. The tour starts on day one with a full-day art excursion led by a local expert from the Tokyo bureau of Blouin ARTINFO, the world’s leading art and culture curators. Next, guests get to explore a one-on-one foodie tour with a local culinary aficionado. Tour options can be catered to individual needs and range from sipping sake with the country’s foremost non-Japanese expert on Japan’s favorite fermented brew, to navigating the famous Tsukiji Fish Market with a local chef, sommelier and book author. On day three, tailor a four-hour private session with a cultural expert to explain and help navigate Japan’s deeply rooted, and sometimes complex, customs and traditions. As a special gift, receive a single, luminous Akoya Pearl to take home as a memento. This was made famous by Marilyn Monroe and cultivated in Japan for more than a century. The luxury accommodations for this package are in the posh Palace Suite, known as the crown jewel of the property. The 210-square-meter contemporary space has its own private art collection, along with views of the city’s skyline, Wadakura Park and Imperial Plaza Park. The Quintessential guests can also be treated to exquisitely crafted seasonal Japanese cuisine with a kaiseki lunch or dinner for two at Wadakura, and unwind from their explorations with two 80-minute Vitalizing Signature treatments at Japan’s only Evian SPA. The stunning lobby area represents a stone garden, welcoming you to the open Alpine-inspired space. With floor to ceiling windows throughout the spa, the blend between nature and self is imminent. The spa’s signature treatment is an indulging cultural experience, with Japanese seitai acupressure-style trigger points being combined with European-style massage techniques for maximum tension relief and relaxation. Seitai is translated to “property ordered body,” and is said to readjust the physiology of the body. 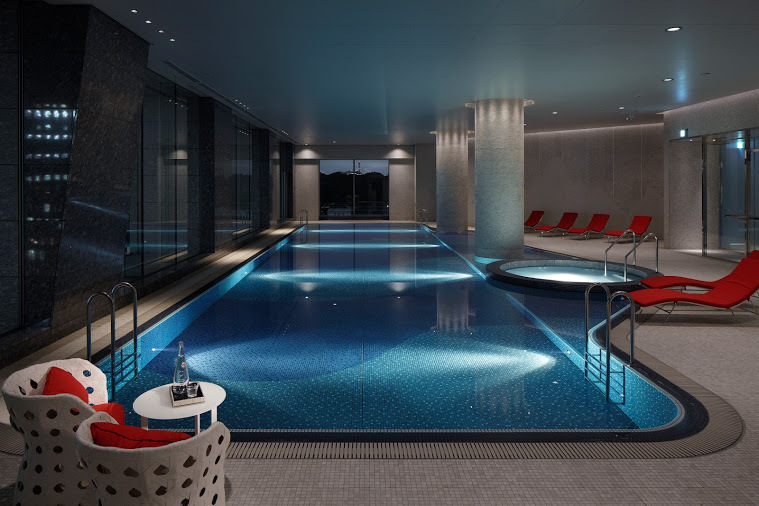 Dignitaries and celebrities from Europe regularly visit the Evian Resort on the shores of Lac Léman in Europe, and now the renowned spa from the Evian Resort makes its first appearance in Japan. An interpretation of “health through waters,” the spa offers a unique combination of hot baths and quality treatments to lighten one’s body and mind from daily life in a serene, peaceful atmosphere using the very best products and service. Services are meant to rejuvenate, renew and refresh. Between spa treatments, guests can make use of the relaxation lounges, sauna, heated baths and indoor pool.